At this three day Tai Kai the five instructors taught three classes each. One big group with everyone, then we had split up the group in two, green belts and the black belts so that the instructors could teach more freely and more detailed to the appropriate groups. See below for details of what they taught. 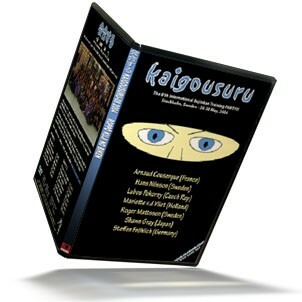 138 minutes where Arnaud taught Taijutsu, the first class was more advanced Taijutsu. The second class was for the green belts where he taught proper Kamae, blocking and movement. 68 minutes where Ed taught breathing techniques, how to use the body structure to your advantage, self defense from a knife attack. To the green belt class he taught Taijutsu from grabbing situations. 90 minutes where Lauri taught Suwari-gata and Tachi-waza techniques from Shindenfudo-ryu. At the green belt class he taught more Taijutsu henka, and a little basics. 90 minutes where Lubos taught Taijutsu feeling from his many months in Japan this year (we did not film the green belt class with Lubos). 88 minutes where Mats Hjelm taught Sabaki, Kamae, Striking and blocking. Sanshin no kata. Sword basics, Iai-nuki, cutting (makiwara cutting), evading/blocking. And Shindenfudo-ryu Taijutsu techniques. Elias taught Kihon Happou with Juppou Sesshou feeling. Dean talked about and taught basic principles in combat. Mats taught the Kunai Kata with help from Onni Koskinen and Ed. Thomas taught Taijutsu and Kunai. Ed taught ten breathing excercises and knife defense. Sveneric taught Bajutsu, Kunai and Sanshin no Kata. Lubos taught Kunai and Taijutsu. Michael Clysén taught Ten Ryaku no Maki techniques and Mariette did henka with the Kunai. 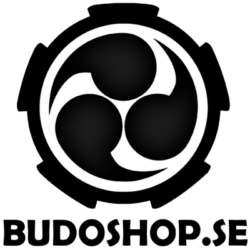 Kaigousuru 4 – the fourth International Bujinkan Training Party with some of the best instructors in Sweden and Scandinavia. The theme of this year was Koto-ryu. This was the 10 year anniversary of Kaigozan dojo. A lot of instructors where invited, and a lot of people came to play and celebrate. This is a very good tape for people that haven’t seen so many instructors move. All the instructors move and teach different, you will get a lot of variety, and a lot of good ideas to play with. 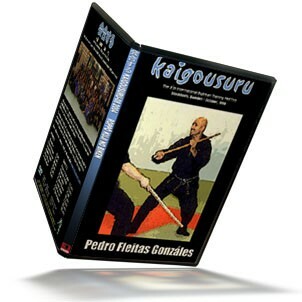 Kaigousuru 3 – the third International Bujinkan Training Party with Pedro Fleitas in Sweden. The theme of this year was Kukishin-ryu Taijutsu. Mr. Brooks “Bing” Ford who was a well known and respected 10’th Dan in Bujinkan passed away 88 years old sept. 24’th 1999. Mr. Ford’s favourite weapon was the Hanbo (short/walking staff). Pedro dedicated this seminar to Mr. Ford and taught a lot of Hanbo techniques. He also taught Taijutsu against one and several opponents, and Bojutsu. Mr. Fleitas is one of the best teachers in Bujinkan with an astounding flow and timing, here he is in top form. – Part 1 ; is from Saturday training. – Part 2 ; is from Sunday training and the extra training on Friday. Kaigousuru 5 – the fifth International Bujinkan Training Party with Sveneric Bogsäter, Mariette v.d. Vliet, Keith Porter, Mark O’Brien, Elias Krzywacki, Rikard Sundelius and many more in Sweden. The theme of this year was Gyokko-ryu and Bujinkan Taijutsu. 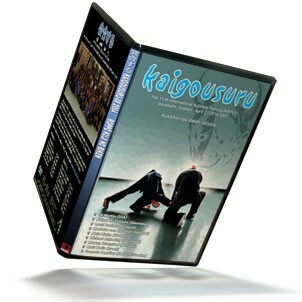 Kaigousuru 2 – the second International Bujinkan Training Party with Arnaud Cousergue, Peter King and Sveneric Bogsäter in Sweden. The theme of this year was Kukishin-ryu Taijutsu. All three teachers teach various aspects of Kihon Happo and Sanshin no kata. Arnaud taught Sword basics at the Shidoshi class for example. Kaigousuru 1 – the first International Bujinkan Training Party with Pedro Fleitas & Arnaud Cousergue in Sweden. The theme was Jo Jutsu and Taijutsu. They taught many Jo Jutsu techniques and henka from Kukishin-ryuu Jo jutsu. They also taught Taijutsu, unarmed fighting techniques.